GEICO Partnership - Lambda Phi Epsilon International Fraternity, Inc.
Dallas, TX (May 10th, 2016) — Lambda Phi Epsilon International Fraternity, Inc. is pleased to partner with GEICO to offer a new member benefit: a discount on GEICO auto insurance. 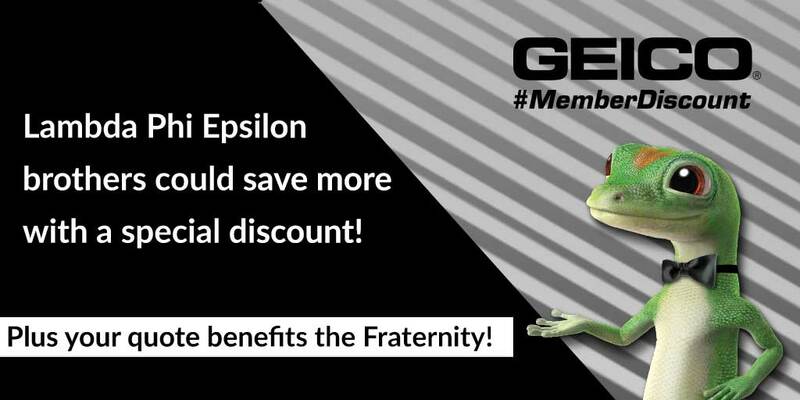 Through the Fraternity’s new partnership with GEICO, Lambda Phi Epsilon brothers may qualify for a special member discount, potentially reducing their auto insurance premiums. Additionally, each quote request helps to support the relationship with GEICO and contributes to the Fraternity. GEICO offers insurance for auto, motorcycle, and boat coverage, and can help members find competitive rates on insurance for homeowners, condo, renters, and much more through the GEICO Insurance Agency. The Fraternity encourages Brothers to consider GEICO when fulfilling these insurance needs. The more quotes from sought out from the Fraternity’s brothers, the stronger its relationship with GEICO. Brothers may visit geico.com/greek/lambdaphiepsilon to get their quote today and begin their cost savings. Founded in 1981 at the University of California at Los Angeles, Lambda Phi Epsilon International Fraternity, Inc. has grown to become the world’s largest Asian-interest fraternity. Lambda Phi Epsilon (ΛΦΕ, also known as LFE) aims to guide men on a lifelong discovery of authenticity and personal growth. The fraternity is affiliated with both the North-American Interfraternity Conference and the National APIA Panhellenic Association. To learn more, visit http://lambdaphiepsilon.com. © 2018 Lambda Phi Epsilon International Fraternity, Inc.